In this tutorial we are going to practice building web components with two exercises: we’re going to use Flexbox to build a “thumbnail list” and a “sidebar” component. In case you aren’t yet aware, “Flexible layout” (Flexbox) is a CSS feature which provides an efficient way to layout, align and order items in a given container. Partnered with Grid and other specifications it makes up a more complete layout module, in answer to floats and tables and other hacks web designers have been using over they years. With Flexbox, items can be laid out in any direction and can adjust their sizes, either growing to fill unused space or shrinking to avoid overflowing the parent. Lists are used to display rows of information, such as a playlists, user details, or movies. Often, these lists contain images that we know as “thumbnails”. Aligning images with traditional methods can be a little tricky and inconsistent, but with Flexbox we can style a list component with minimal CSS. This figure illustrates how flex-shrink and flex-grow behave. 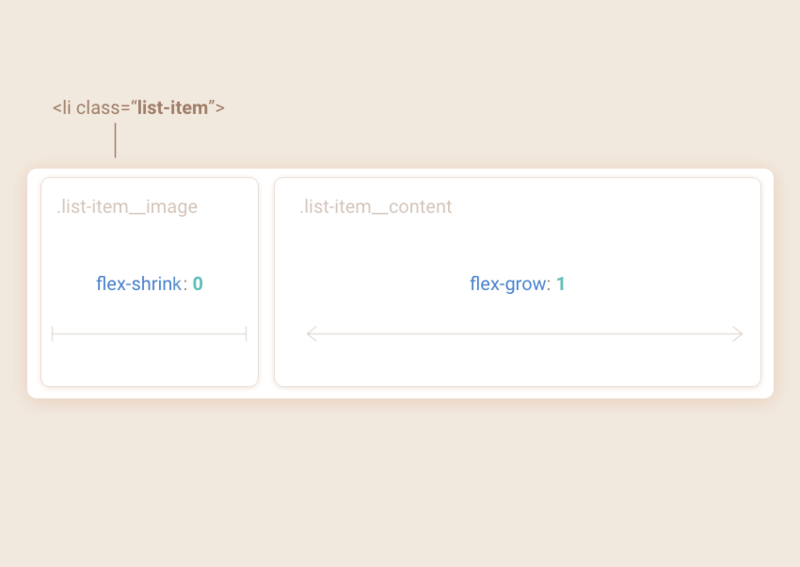 The .list-item__image item will never shrink, and the .list-item__content will take up the remaining space in the li container. You’ll see the avatars are positioned to the left, the details to the right. You can see the full CSS on CodePen and play around it. 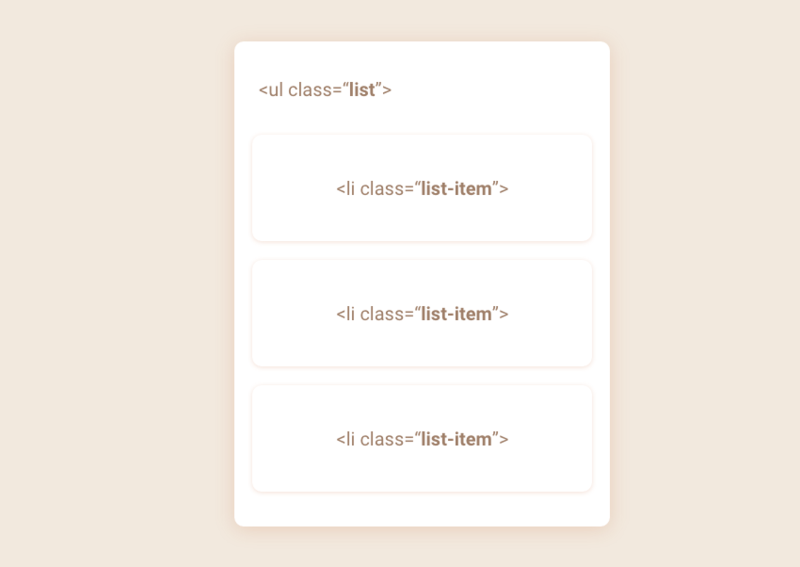 For example, if you move .list-item__image after .list-item__content in the HTML you will get a thumbnail list with images on the right side without having to use any additional classes or styles. Many websites and web applications use a sidebar for navigation. In this exercise we are going to build a reusable sidebar component using Flexbox. Typically, the tricky part of building this kind of layout is placing the profile block at the bottom of the sidebar. With this “traditional” solution, we assume that the user profile’s height will be 70px. So we give 70px of padding to the bottom of the sidebar in which to place it. But what if at some point we redesign the profile box so its height changes? Or we decide to place it at the top? In these cases, we’d need to create additional classes for the sidebar or modify the current styles, neither of which are ideal. The top and bottom parts of the component remain “un-shrinkable”. The central element .sidebar_nav will fill the rest of the space thanks to its flex-grow: 1;. 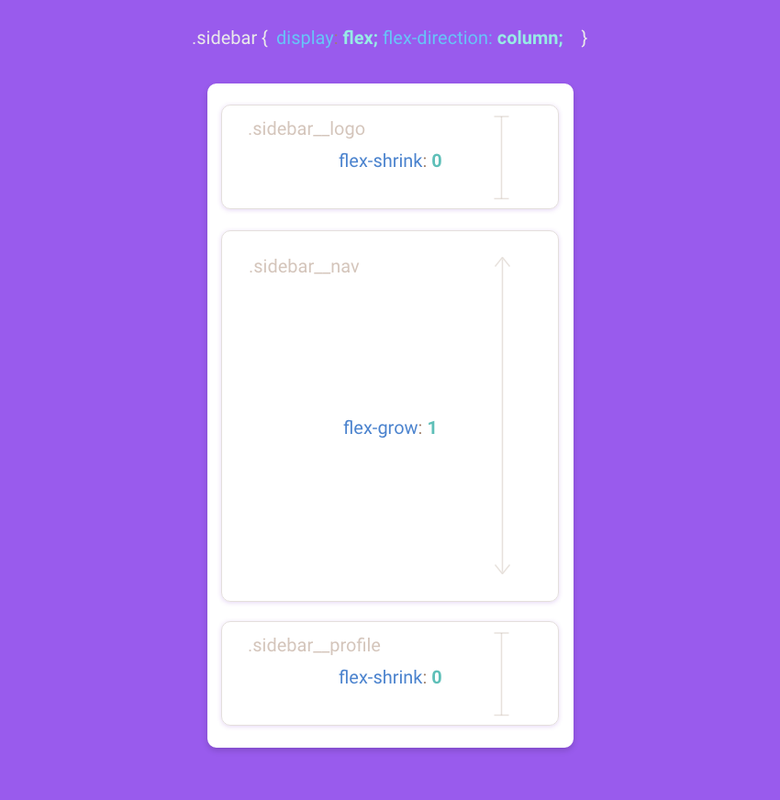 To recap, the .sidebar component has a property flex-direction: column which will transform the flow of its children elements from horizontal to vertical. .sidebar__nav has the property flex-grow: 1 which means that it will take all the available space in the container and will push .sidebar__profile box to the bottom of the sidebar. With this approach, we don’t need to worry about the profile box height. So, what does this give us? This is the final result of the sidebar with additional styles, including some icons pulled in from Fontawesome. Flexbox has really changed the way we can think about layout on the web, and happily it’s supported by all modern browsers. In this tutorial, we used just a few properties of Flexbox, but there are many others as you may imagine. In the next “Exercises in Flexbox” tutorial, we will build more intermediate components, covering other Flexbox features along the way.